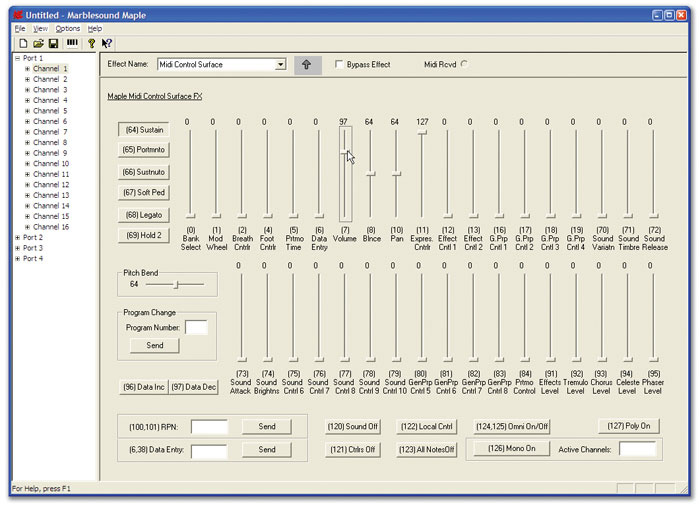 The right freeware or shareware utility can be a godsend for the PC musician. It might help you track down an annoying problem, cure it or bypass it altogether; it might provide you with a new means of generating or modifying sounds; it might simply save you money you'd otherwise have had to spend on a commercial equivalent. Ironically, although such utilities are often quick and easy to download via the Internet, their relatively small size often results in them being overlooked among the morass of available files. Some of the best ones aren't hosted on the mainstream web sites either, but on the developer's own pages. So this month I've rounded up some of the most useful utilities that should specifically interest the PC Musician, organised into various categories with suggested uses. Many new musicians seem to be moving across to making music on their PCs after working for years on hardware multitrackers or elderly Atari ST computers, so I make no apologies for including some old favourites in the list. However, whether you're a newcomer or an expert, there should be something for you. The majority of the utilities I include are freeware, and the few shareware ones have very reasonable registration fees considering how useful they are. There are those who consider MIDI an outmoded technology — sales of new MIDI hardware synths are falling, and some musicians are busy selling their existing ones second-hand because they now use totally software-based sources. However, other musicians are eagerly snapping up these bargains, and anyone who uses a VST or DX Instrument is probably still using MIDI data to trigger it from an external keyboard. Moreover, MIDI controllers are an incredibly popular way to add real-time expression to MIDI performances, to automate both MIDI and audio sources, or simply to control sequencer functions from a distance. So, given that MIDI still plays a big part in many musicians' lives, what can utilities do to enhance this experience? For many, a big frustration comes when they're trying to make a certain controller change a particular synth parameter and nothing is happening. If you know what data you're trying to generate from your controller, the answer is to monitor what's actually coming out to see what's amiss — it may be something as simple as incoming data being sent on the wrong MIDI channel. For many years, the standalone 800KB MIDIOX has performed this function for me and many other musicians with finesse, and it's still a free download from www.midiox.com. 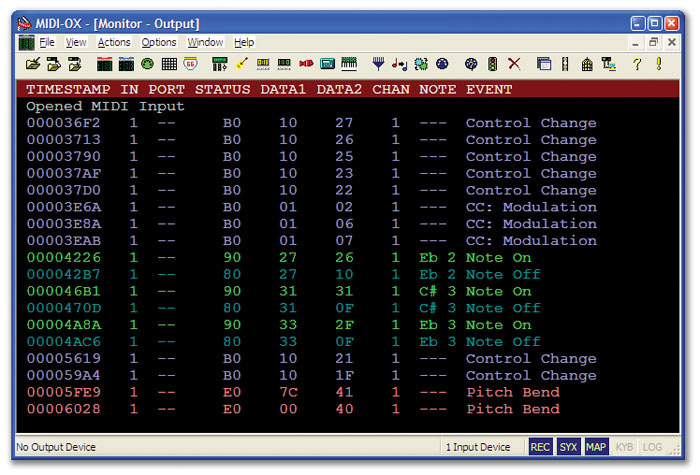 All you need to do is open its MIDI Devices window, select the MIDI input that your controller is connected to, and then you can view every MIDI message the controller generates. For those who want to see which MIDI data is arriving inside their VST-compatible sequencer application, Wally Cescato's MIDI Data Monitor (www.freewebs.com/wallyaudio) loads as a VST Instrument and displays incoming MIDI note, aftertouch, pitch-bend and controller data on four 'LEDs', as well as providing a scrolling data display in text form. Those with hardware MIDI synths will easily find loads of soundbanks for their particular make and model on the Internet, but after you've downloaded these SysEx (.SYX) files to your PC you'll need a way to send them on to your synth. Sonar users can do this directly (as can users of Cakewalk's older Pro Audio sequencer range) but if, like Cubase, your sequencer doesn't recognise such files, you'll need a suitable utility. Once again, MIDIOX comes to the rescue. However, if you want something even simpler that's devoted to SysEx transfers, SendSX (www.bome.com/midi/sendsx) also works with all versions of Windows. There are still times when MIDI routing utilities are useful. Some can add multi-client support to MIDI hardware that doesn't have it, so that you can route a sequencer and synth-editing software simultaneously to the same MIDI output for changing sounds while playing back a song. Hubi's Loopback and Herman Seib's MultiMID were the ones that started it all for Windows 3.x and 9x, and they're still available (http://members.nextra. at/hubwin/midi.html and www.hermannseib. com/english/multimid.htm). Others can act as MIDI patch cables, so that you can port data from one application to another in real time, or modify incoming MIDI data before sending it on elsewhere. Hubi's MIDI Cable did this for Windows 3.x and 9x, while Jamie O' Connell's MIDI Yoke (www.midiox.com/myoke.htm) worked for many on Windows NT and subsequently Windows 2000 and XP, but caused problems with Tascam's Gigastudio. MIDI is still an important part of most musician's performances, and utilities such as MIDIOX, Maple Tools and Markleford Friedman's MFX plug-ins, shown here, can help you get the right MIDI data to the desired destination. Fortunately, a modern patch-cable alternative is now available that seems to work with everything: Marble Sounds' Maple Virtual MIDI Cable (www.marblesound.com/ Maple_driver.html) is freeware and runs on Windows 95, 98/ME, 2000 and XP. Once you've installed it and rebooted, it appears in all your MIDI applications as four extra MIDI Ins and Outs, so if, for instance, you want to send the MIDI output from your main sequencer to a stand-alone soft-synth, you can select Maple MIDI Out: Port 1 in your sequencer and Maple MIDI In: Port 1 on the synth and the two applications will be connected via MIDI. This really is a handy utility to have installed. The associated Maple Tools utility (www.marblesound.com/Maple_tools.html) either accepts MIDI data from your sequencer via the Maple MIDI Outs, or directly from up to four hardware MIDI input ports, and then modifies it in various ways in real time, using various plug-ins individually configured for each channel of each port. There are two plug-ins bundled with the utility: Layering lets you achieve complex patches by sending the incoming MIDI data to any combination of channels on multiple output ports, while MIDI Control Surface lets you send a huge variety of controller-data messages using software sliders and buttons. 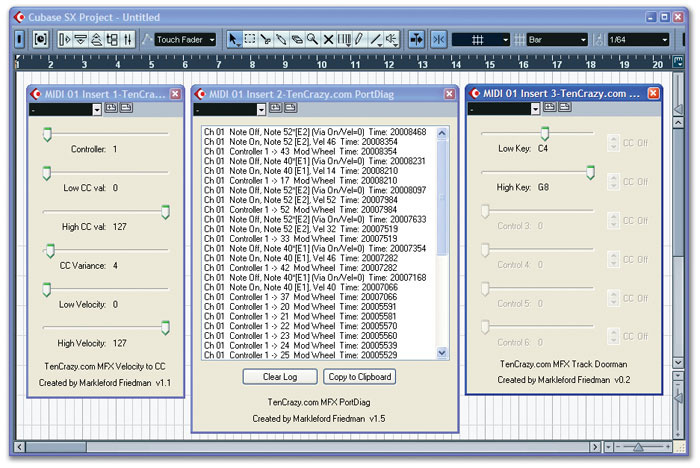 Various third-party developers have added special performance features to their sample libraries by writing plug-ins for Maple Tools. For instance, PMI supply their Grandiose FX plug-in to enable users of their Gigastudio piano libraries to re-pedal (switch between sustaining and no-sustaining samples in real time), and add pedal-noise samples and extra release samples. This is a free download for those who would like to try using it for other applications (www.postpiano.com/Maple/Ind/GrandiosoFX.zip). Gary Garritan also includes the Maestro Tools plug-in for his Orchestral Strings, to add legato, alternating bow strokes and mono mode to its repertoire. For those who would prefer to record their MIDI data in its original form, then modify it inside their sequencer in real time via a MIDI plug-in, there are lots available to suit any sequencer that accepts plug-ins in MFX format, which includes Cubase, Nuendo, Sonar and Project 5, amongst others. 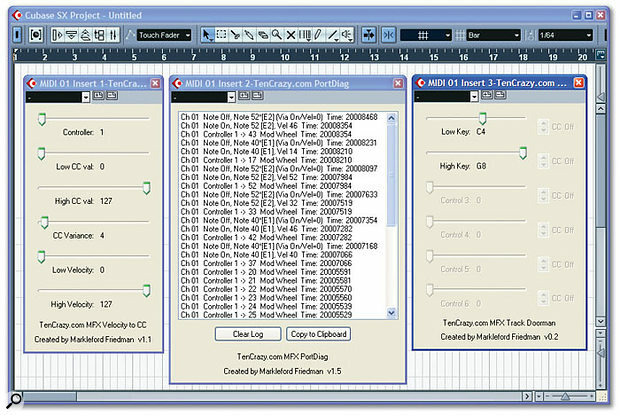 There's a wonderful collection of 19 plug-ins by Markleford Friedman at Ten Crazy (www.tencrazy.com/gadgets/mfx), including MFX Auto Alternator, which provides the alternating bow strokes feature of Orchestral Strings, but with options to send the alternate messages to different MIDI channels so that you can create the same effect with your own sample sets. Others include MFX Track Doorman, which ensures that only notes from a specific key range reach your synth (ideal for making sure your string orchestrations are correct), MFX Kick Peddler, to convert sustain pedal or other switch movements into kick-drum data, and MFX Key Tweaker, to generate any controller data from a range of keys, for those who don't have modulation or pitch-bend wheels on their keyboards. Some users have found the install process confusing, but all you do is unzip the three files belonging to each plug-in into any folder of your choice. In the case of Cubase SX, I just created an MFX folder inside my existing VST plug-ins folder. Then you double-click on the file ending in 'BAT', to let the Windows Registry know of its existence. Further MFX plugins can be found at the Frank's MIDI Plug-ins web site (www.midi-plugins.de), and Nicolas Fournel's web site (www.nicolasfournel.com). Where Can I Find Utilities? Cnet's Download.Com (www.download.com) provides many categories, but has a handy search function, so you can narrow down the options when you're looking for something in particular. Download FreeTrial (www.downloadfreetrial.com) is, as its name suggests, a web site where you can download free or trial versions of software. I mention it because I found quite a few utilities here that I hadn't spotted elsewhere. Nonags (www.nonags.com) is unusual in having mirror sites around the world hosting its contents to make them quicker to download, and in hosting freeware only. It's been around since 1995 and is now absolutely vast, yet very clearly laid out, with descriptions, ratings and links to authors' home pages. Simtel (www.simtel.com) is slick and very professional and has a filtering system so that you can specify the operating system, type of license (freeware, demo, shareware, and so on), price, user ratings and even file size, to narrow down your search. Snapfiles (www.snapfiles.com) is vast. The two innocuous buttons, labelled Shareware and Freeware, near the top of the main page take you to one of the biggest selections of downloadable files on the Internet, each with several hundred categories. The Multimedia sections aren't all that useful to musicians, but there are loads of general-purpose utilities and a very good synopsis and rating system. Softpedia (www.softpedia.com) is a vast repository of shareware and freeware for both Mac and PC. The Windows section offers 19 categories, but many of these are further divided into sub-categories to make searching a more productive experience. SourceForge (http://sourceforge.net) has over 100,000 registered products across 19 categories and caters for the academic as well as the more casual user. This is a site at which you could profitably spend quite a few rainy afternoons. Tucows (www.tucows.com) is always a little slow to appear for my liking, partly because of the number of ads, but it has 660 titles in its Audio section so it's well worth a visit. UtilityGeek (www.utilitygeek.com) provides a huge range of diagnostic tools and utilities for the PC owner, neatly split into 22 categories. Audio Tools Direct (www.audiotoolsdirect.com) has about 600 downloads available, although most of their 29 categories contained little of interest when I looked. DA Sound (www.dasound.com) has a good search/browse function that helps you narrow down the options. Particularly useful is the browse-by-platform option (if, for instance, you're only interested in files that are compatible with Windows XP). Harmony Central (www.harmony-central.com/ Software/Windows) has another large collection of audio-related shareware and freeware. Hitsquad's Shareware Music Machine (www.hitsquad.com/smm) has over 5000 software items to download, sorted into about 100 different categories, and I suspect that it's the most comprehensive site of its type around. Partners In Rhyme (www.partnersinrhyme.com/ pir/PIRwindows.html) has a good selection of audio and MIDI files, but many of them are rather old, and with few details provided you can waste a lot of time downloading things that you subsequently find will only run on Windows 3.1. Synth Zone (www.synthzone.com/utilities.htm) has plenty of music-related links, although, once again, many of the utilities are quite elderly. Most audio manipulations are now carried out within host applications that already contain many internal transformation tools, and most support VST or DX plug-ins that can add loads more, so stand-alone audio utilities are becoming of less interest nowadays. Nevertheless, I did find some intriguing tools in my travels. Let's start with a couple of very handy stand-alone tools from AnalogX (www.analogx.com). Delay Time Calculator does just what it says on the virtual tin: you enter the tempo of your song in BPM and it provides a readout of seven note lengths in milliseconds that you can dial into your hardware or software delay unit. Tap Tempo is for when you don't know the tempo of a song — just press the space-bar on each beat and a tempo readout magically appears. At 209KB and 206KB respectively, you can't go wrong. The freeware Soundplant is a handy sample-triggering tool that you could use during live performance. 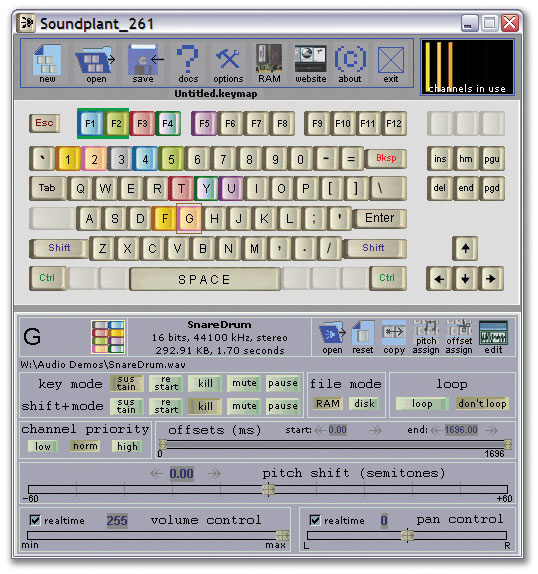 The freeware Soundplant (www.soundplant.org) could prove very useful to some musicians, as it turns the computer keyboard into a sample-triggering device capable of assigning WAV or AIFF files to up to 72 different key combinations. You can then use it as a rough-and-ready drum pad, or as a performance or installation tool. The software's graphic interface allows drag-and-drop configuration of each key, with controls for pitch, offset, volume, pan and looping, and you can batch-assign the same file at different pitches and offsets across multiple keys. Just make sure that your keyboard repeat delay is set to High and the repeat rate to Slow. Coagula (http://hem.passagen. se/rasmuse/Coagula.htm) is described as an 'image synth' and provides a range of drawing tools for creating graphic images that you can then render into a WAV file. 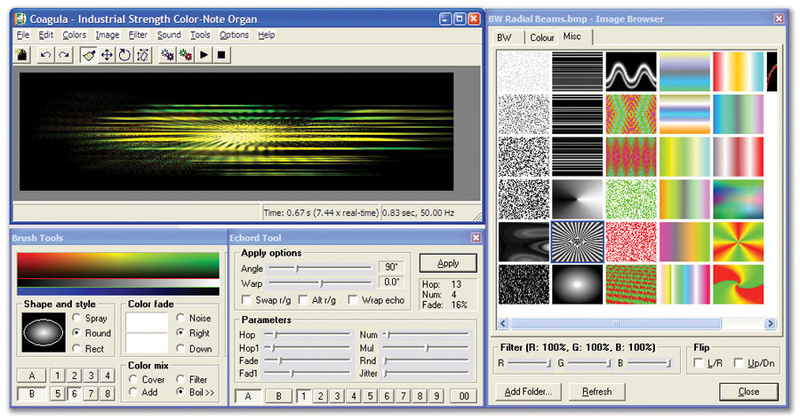 Each line in the image controls the amplitude of one sine-wave oscillator at a specific pitch, and different colours determine stereo placement and noise contributions. Included are a variety of unusual filters, overlays and tools, and the results range from drones through washes of sound to evolving sci-fi soundscapes. You can also import BMP files. Audiopaint (www.nicolasfournel.com) is rather simpler, providing no drawing tools but offering the facility to import GIF and JPEG as well as BMP images. You can also use a sample instead of sine-waves to generate your sounds, for very different results. Creating sounds from images may generate some fresh inspiration, using utilities such as Coagula. If you want to explore the outer fringes of audio, pay a visit to The Transparent Corporation (www.transparentcorp.com) and enter the mysterious world of brainwave manipulation. Here you can download a demo version of the Brain Sound Studio that embeds 'brainwave entrainment' into any sound or music file of your choice, using a series of over 70 brainwave transform filters. Traditionally, such techniques have involved binaural beat frequencies that you experience under headphones only (signals that differ by a few Herz are sent to each ear separately), and while Brain Sound Studio can produce these, it can also be used over loudspeakers and even in mono. It sounds ideal for any musician working with trance or relaxation music, or who wants to add a hidden edge to their music, and the full version costs just $45. We regularly get new members on the SOS Forums asking how they can find out what motherboard make and model they have in their PC, or what processor, how much RAM and of what speed. Probably the most comprehensive utility that can tell you all this is SiSoftware's Sandra (www.sisoftware.co.uk/sandra), which provides a host of modules covering Information, Testing, Benchmarking, Listing and various Wizards. You can learn a vast amount about your PC from these, and use the information to test the performance of the PC's various sub-systems. 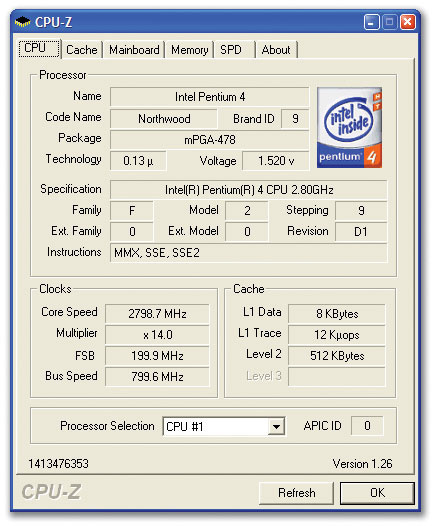 However, the beginner or casual enquirer could easily become overwhelmed with Sandra 's data read-outs, and for quick-and-easy display of all the parameters mentioned above the freeware CPU-Z (www.cpuid.com/cpuz.php) is hard to beat. It provides just the right amount of information in one tabbed interface covering your CPU, Cache, Mainboard, Memory and SPD (Serial Presence Detect) read-out from each RAM slot. The other area that beginners often find they want to measure is hard drive performance, especially if their system can only manage the playback of a few dozen audio tracks before running out of steam. DskBench (www.sesa.es) is a perennial favourite for this, as it's tiny (just 36KB) and can be dropped into each partition on a drive and run from there to measure the drive's sustained read/write transfer performance, check that the drive is correctly using DMA (Direct Memory Access) for low CPU overhead (this is a common reason for poor audio playback performance) and give you an idea of how many audio tracks you should be able to run with different disk-block buffer sizes in your sequencer application. Dskbench 's read-out is text-only, but if you're not sure what results you should be getting this makes it easy to paste your results into the SOS PC Music Forum, where more experienced users will soon provide feedback. The quickest and easiest way to find out what hardware is inside your PC is to run CPU-Z, which will interrogate your CPU, motherboard and RAM. If you'd prefer a graphic display of sustained drive performance, HD Tach (www.simplisoftware.com) is probably your best bet. Rather than providing individual transfer rates for each partition, it shows how this parameter varies from the outside (fastest) to the inside (slowest) of each of your drives, as well as providing a CPU utilisation figure. If this encourages you to think more carefully about how your various drives are partitioned, all the better. Once you understand the ins and outs of partitioning (see PC Musician May 2005 for more details), it's well worth installing a music-only Windows partition alongside the one you use for more general activities such as Internet surfing, word processing and so on. You can separately install Windows into several partitions by using its 'install new copy' option, and use Window's own basic boot-manager utility to choose which one to run each time you boot up your PC. Quite a few musicians do this with no problems at all, but others aren't quite so lucky, running into problems and limitations. If you're prepared to lay out a little money and want a considerably more versatile boot manager, Terabyte Unlimited's Boot It NG (Next Generation) is just $35 and provides a boot manager, a partition manager (not as versatile as Partition Magic, but good enough in many cases) and a partition-imaging utility so you can save compressed security copies of partitions, as well as cloning them. Since it doesn't run from Windows, you can also use it to image Windows itself. However, another product could well claim the prize of 'ultimate boot manager'. Star Tools' Bootstar (www.star-tools.com/bootstar/english) also increases the limit from four to 15 primary partitions per drive, but is the only boot manager, to my knowledge, that provides extra security features, by physically hiding each Windows partition so that when you boot into another one it's entirely unaware of the other's presence. Bootstar lets you choose an entire profile consisting of up to four visible partitions out of the 15 possible, and in its Profi security mode doesn't simply restrict access to 'hidden' partitions, like most other boot managers, but instead deletes its MBR (Master Boot Record) information so that the partitions cannot even be seen from partitioning tools such as Partition Magic or Windows own FDisk (although you can temporarily deactivate it to carry out maintenance work). If you're concerned about the possibility of a music-only partition getting virus problems, I know of no way for any infection to pass from an Internet-enabled partition to one that's totally invisible until you reboot into it. Like Boot It NG, you can test Bootstar for 30 days without any restrictions, then it costs just $25 to register per computer. Unfortunately, I can't show you screenshots of either of these utilities, because they are installed and run long before your PC reaches the Windows environment. There are so many utilities out there that it's difficult to sort the wheat from the chaff (which is the main reason for this round-up). However, if you're searching for something different, here are a few things to remember on your travels. Some MIDI utilities, in particular, date right back to Windows 3.1 and may or may not run under the Windows XP that most of us are now using. Unfortunately, not every download site provides details of release dates or supported operating systems, so if the utility appeals you may have to do some detective work. If the file is in zipped form, you'll be able to glean a lot from the date-stamps of the files within it, and if some of them are dated 1993 be wary: the utility may still run, but it may need some elderly DLL files that are no longer part of Windows. If you just get a Setup.exe file you won't have any idea of its release date, but if it suggests when you run it that it should be installed in the root C: directory, or doesn't cope with long folder names (abbreviating them with the tilde '~' symbol), it's probably very old. If you intend to try out a batch of utilities, the safest approach is to first make an image file of your Windows partition. Then you can install what you like, safe in the knowledge that if anything goes awry you can restore the image file to return your hard drive to the state it was in before you started (that's what I did while researching this feature). Occasionally you can download a file and find that it's in a compressed format Windows won't read automatically, such as RAR or UUE. One of the best utilities for dealing with such formats is WinRAR (www.rarlab.com). It's available in a huge number of different languages and can either be launched as a stand-alone application onto which you drag and drop supported file types or can be integrated into Windows Explorer for right-click Extraction options. WinRAR is shareware. You can use it free for a 40-day trial period and a single license costs about £19. The only compressed format I've ever had to deal with that wasn't covered either by Windows or WinRAR is MIME, which can occur with encoded email attachments from Mac users. 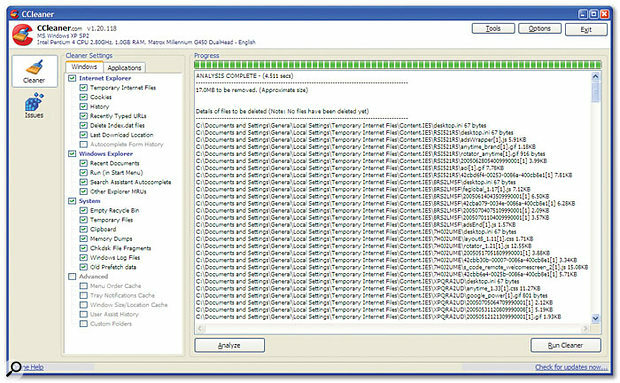 If you ever find yourself with a stray file ending in .MIM, the usual suggestion is to download and install Allume's Stuffit Expander (www.stuffit.com/win/expander/index.html). What you're actually doing is installing a 15-day trial version of Stuffit Standard Edition that includes the free Expander tool. If you'd prefer a much smaller (310K) download, try the freeware Decode Shell Extension from Funduc Software (www.funduc.com/decext.htm). This adds a Decode function to Internet Explorer that will extract multiple files from within a MIME one. While the majority of musicians now have few problems achieving smooth audio recording and playback, there are still regular posts on the SOS Forum complaining of occasional clicks and pops. One of the commonest problems afflicting the PC musician still seems to be unwanted third-party tasks running in the background and interrupting audio recording and playback. 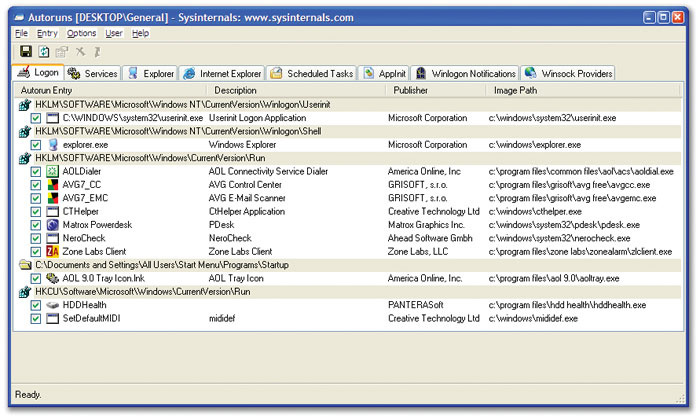 The quickest way to see which processes are currently running is to use the Ctrl-Alt-Delete key combination to launch the Windows Task Manager, but although this provides a long list of candidates, many of them are required for the normal running of Windows and are cryptically named. As many third-party tasks are started each time you boot up Windows, it's generally more useful to search these out. Microsoft provide the System Configuration Utility, which you can launch by clicking Start, then Run, typing 'msconfig' into the text box and then pressing return. On the Startup page you'll find a full list of tasks that are either in your Startup folder or in the Run or Run Once sections of the Windows registry (Run Once tasks generally initialise something, while Run tasks continue to run behind the scenes as long as your PC is on). If you suspect that one of these tasks is causing a problem you can go to the General page and click on Selective Startup. Then you can individually tick or untick the boxes in the Startup page and re-boot to see if bypassing a specific task has cured the problem. Tracking down unwanted Windows startup tasks and laptop power-management issues that cause audio clicks and pops is made easier using utilities such as Autoruns. Alternatively, the easiest utility I've found to do all this is the freeware Autoruns from Sysinternals (www.sysinternals.com). 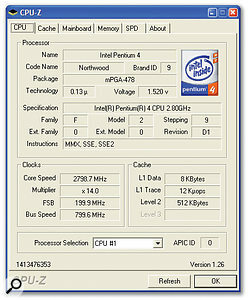 It runs on all version of Windows, provides a clearer display with more meaningful names, offers icons to make each task easier to recognise, has the most comprehensive knowledge of auto-starting locations of any startup monitor, and even displays the entries in the order that Windows processes them. Musicians with laptops also suffer occasional audio pauses, but for an entirely different reason. On many modern designs the power management functions try to maximise battery life and keep the device cool by throttling the CPU frequency and reducing its operating voltage in real time if you require less computing power, smoothly ramping it back up when you need it all. Unfortunately, on a few models each such change can result in an audio interruption. 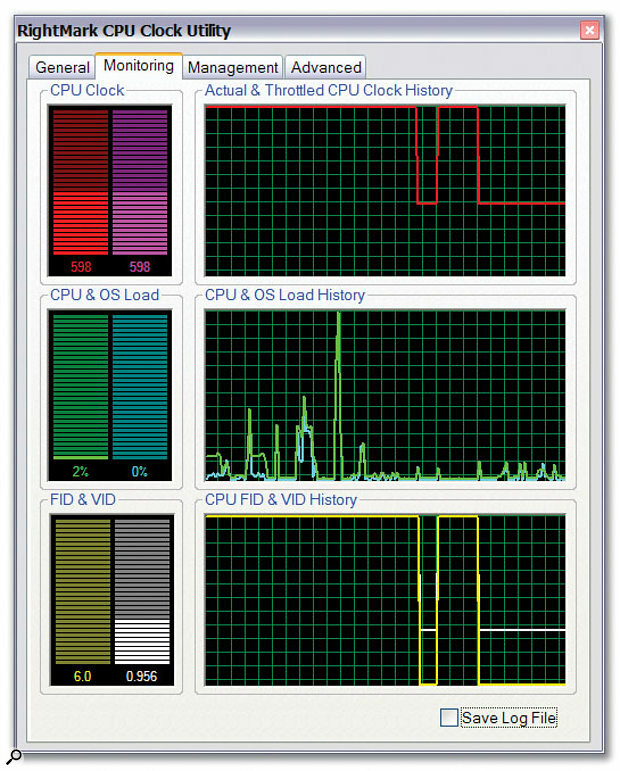 If you suspect this could be true of your laptop, try downloading Rightmark's CPU Clock Utility (see opening screen above), from http://cpu.rightmark.org/download/rmclock_16_bin.exe, and monitoring the throttled clock frequency to see if changes coincide with these interruptions. If they do, you can contact your laptop supplier or manufacturer to see if there's any way to disable the power-management functions. 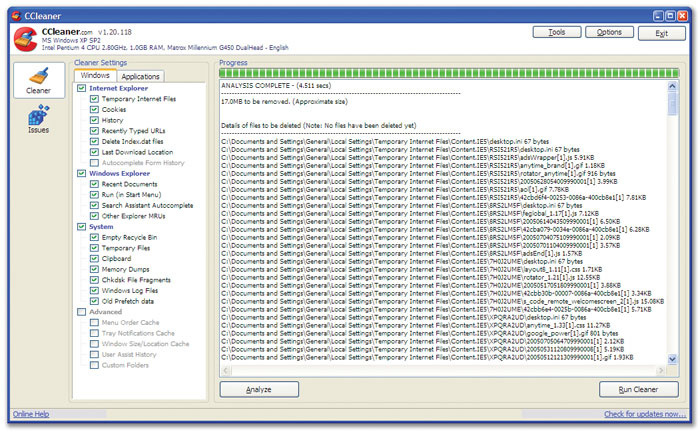 CCleaner will keep your PC optimised and remove traces of your Internet activities. Finally, I've recently found another handy and reliable Windows cleaning tool that removes many unwanted files from your system, including those generated by browsers such as Internet Explorer and Mozilla's Firefox that compromise your Internet privacy, temporary files left by loads of third-party applications, and the usual temporary Windows files. It will also offer to separately clean the Windows Registry of similar detritus. CCleaner (www.ccleaner.com) is freeware, and has already been downloaded by over six million people, including me!